If you haven’t heard yet – You now must have a Sailing License for chartering a sailboat in the Mediterranean. No matter how much experience you have and no matter who you are, you have to have a license. Why? Just do! Don’t believe us? Call any yacht charter company. Most will refer you back to NauticEd because we have the simplest, quickest and least expensive solution; the SLC. What is the SLC? 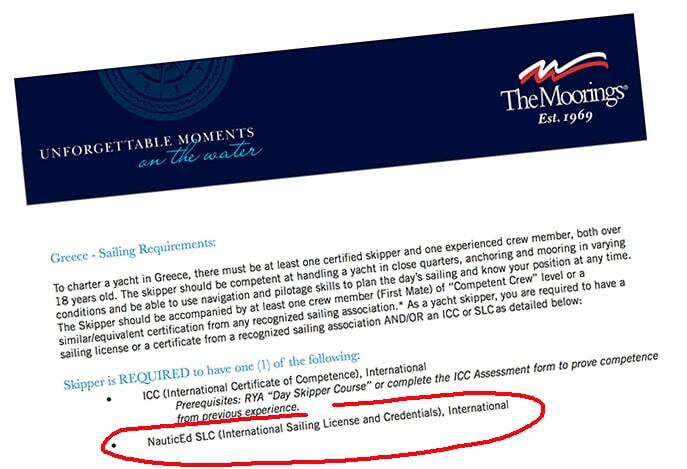 The SLC stands for Sailing License and Credentials. It is a sailing license that is accepted for bareboat yacht chartering in the Mediterranean. Chartering in the Mediterranean requires more than a certification – a true license is required. But be careful with licenses issued by other sailing associations. Some licenses are not accepted and some associations issue a license without requiring proper experience. Genuine knowledge and experience is required along with the license. That’s why NauticEd requires knowledge learning and testing, skills assessment, and logged experience along with appropriate licensure prior to being awarded the SLC. So, How Do You Get an SLC? Gaining the SLC is a relatively quick and simple process! Click on the big International Sailing License button. This will bring you to a page listing the requirements to gain the SLC. Items on the list automatically go green as you complete each item. Once all items are completed, the SLC is automatically and instantly issued to you for download. It is presented in multiple languages for convenience for presentation to the port authorities and yacht charter company. Complete the NauticEd online Bareboat Charter Master bundle of courses including the associated online tests ($175). Take the tests as many times as you like for as long as you like. Start-stop anywhere. There are no extra fees if you fail or take too long. If you’re confident with the material, you can always jump to the test at the end of each module. Complete a comprehensive free online NauticEd SLC exam covering all aspects of sailing, navigating, and bareboat chartering. If your country requires you to have a boater license, upload a front and back image to the NauticEd International Sailing License page in your portal. In the USA, you must gain your State Boater License Card by going to www.boatus.org/free (it’s free) and take the online course for your state. If your state is not listed, take any state license as there is reciprocity acceptance between the states. In Canada, obtain your PCOC. Under your free NauticEd account there is an electronic logbook. Make entries of your past sailing experience starting with your most recent and working backward in time. The SLC requires at least 50 days (a day being 4 hours minimum) of experience, 25 of which must be as master of the vessel and 25 must be on a boat greater than 28 ft (8.6 m). Plus you must have recent experience upon issuance or re-issue of the license: either 5 days in the past year or 10 days in the past 2 years. The SLC requires you to complete and pass a one-day on-the-water- assessment of your skills and knowledge with an SLC approved assessor. You will be tested on your sailing ability and competence on a variety of topics including docking using spring lines, Mediterranean mooring, person overboard, navigation, plotting courses, understanding ColRegs, meanings of ATONs, IALA-A vs IALA-B. If you complete the online Catamaran course ($27) and log large catamaran experience, you will be awarded a valid catamaran endorsement on your SLC document. The fee for the SLC sailing license is $95. Simply go to our SLC page – www.nauticed.org/SLC. On that page enter the example student Joe Sailor’s ID number “63302191” and Joe Sailor’s secret logbook code – “mycode”. The Course materials will take approximately 40 hours to complete. This can be done faster if you are already knowledgeable. You can at any time during the course, jump to the test. The one-day assessment will take … one day. Once all the conditions are met, the license is issued immediately in real-time and ready for immediate download. The SLC is not the ICC (the United Nations created the International Certificate of Competence), but for all intent and purposes, it works just as well. While NauticEd can facilitate you getting the ICC through our alliance with the esteemed UK Royal Yachting Association (RYA), it can be impractical for most North Americans because there are only 3 schools in North America (2 schools in Canada (Halifax and Toronto) and one in the USA (Pensacola)). Thus, for most people, the SLC is much more accessible since there are many schools able to perform the required 1-day assessment of sailing skills. We respect your existing knowledge and thus we don’t condescendingly make your start at the start and make you do basic training if you are already experienced and skillful. Rather, you can jump in at any level and just pass the all the online exams and do the on-the-water assessment without training. Many schools offer, what we call, a rust-removal day prior to the assessment day. This ensures you can pass the assessment requirements. e.g. Can you Mediterranean moor in a crosswind? Can you dock and leave the dock using spring lines? Can you sail up to a mooring ball and stop? Give a tide range, can you calculate the depth at a certain time of the day? If you are rusty, we recommend a rust removal day ( Additionally both of these days, rust removal and assessment, will count towards your recent 5-day requirement above). On our sailing schools page, look for the SLC logo associated with each school. If you can not find one close to you, contact us since our network of schools is growing fast and changes weekly. Email us and we will be happy to answer it plus we will put the question and answer on this page.